Bengaluru FC made a big statement of intent, beating a strong East Bengal side 1-0 after skipper Sunil Chhetri tapped home in the 60th minute to sink an otherwise noisy Barasat Stadium into silence as the Blues made sure they left Kolkata as table toppers, on Saturday. Most of the talk building up to the game revolved around the fact that Bengaluru FC had never scored against East Bengal in Kolkata, let alone beat them. And Rino Anto, addressing the question in the pre-match press conference, vowed that both the jinxes would be broken. It was only fair that the right-back provided the assist for the goal. Ashley Westwood went into the game with a fairly altered starting XI from the side that was beaten 2-0 in Mumbai on Wednesday. Amrinder Singh was handed his debut in goal while Len Doungel earned his first start. Young Malsawmzuala and Thoi Singh were the other two changes that the gaffer effected, in midfield after Eugeneson Lyngdoh’s knock on his ankle that he picked from the Mumbai game, hadn’t healed completely. Bengaluru FC’s best chance of the first half came in the 40th minute when Doungel handed Kim a cut back that the striker should have done more with than flash wide from just outside the box. Westwood and the Bengaluru bench had their arms up soon in the second half again when Chhetri, unchallenged, saw his shot saved by TP Rehenesh after being found at the end of Shankar Sampingiraj’s cross from the right. But Chhetri didn’t have to wait long to makes amends, turning up at the right place and at the right time to tap in Rino Anto’s cross on the hour mark that sank Barasat into silence. With no choice but to chase the game, East Bengal threw numbers in attack only to be caught out on the counter by the Blues who used Len’s pace to good effect. Bengaluru, in fact, could have got a second only three minutes later when Kim, after combining well with Chhetri and Len, saw his shot saved by Rehenesh from close. 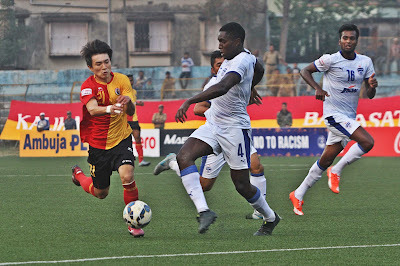 Desperate for a goal to bring them back in the game, East Bengal pushed further but The Blues’ defence was too compact to let anything through. John Johnson and Curtis Osano gave Ranti Martins no joy while Lalchhuanmawia put in a brilliant shift in shutting out the pace of Do Dong down the left. Anything that did get past them was comfortably dealt with by Amrinder who pulled off a good save off a Dong freekick late in the second half and it was his composed show that saw him walk away with the man-of-the-match gong. Bengaluru now have 12 points from five games and play their next three games at home, hosting Sporting Clube de Goa (Feb.6), DSK Shivajians (Feb.10) and Mohun Bagan (Feb. 13).